Aside from the holidays coming up, we also celebrate my birthday this month and right after Christmas we throw our annual New Years party. This year's theme is Ugly Holiday Sweaters. I'm pretty excited about it this year because our almost finished basement will be up and ready for everyone to enjoy. I can't wait to see the look on the kids faces come Christmas morning when they have their rec room ready to play in. So it's been a crazy couple of days over here. I wish I could say that it's been just because of the up coming gatherings and parties waiting to happen, but for me it's been because I have been without coffee for over two days until now. For some reason I ran out without knowing and then to top it off I went grocery shopping yesterday, went down the coffee aisle and DID NOT pick any up. I don't know what was going on in my head. So this morning after finishing up some work and returning a bit of emails I went to the store, ran directly to the coffee aisle and grabbed the biggest container of Folgers I could find. 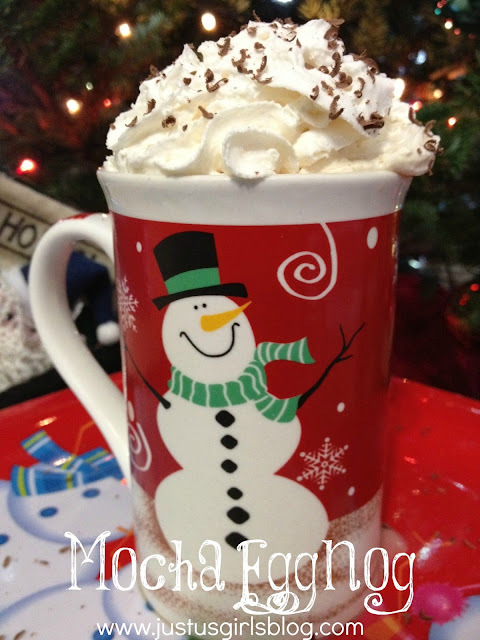 This leads me to our Thirsty Thursday drink, Mocha Eggnog. It's perfect for the weather we've been having and can be served with or without a little bit of Bailey's. I've been drinking this drink since September when I found it on Better Homes and Gardens website and I love it. Pour in coffee in mug. Mix in Eggnog, chocolate syrup and stir. Add more or less depending on your taste. Top with whip cream and shaved chocolate. Drink and enjoy!